After the cleaning, imaging and milling operations, the rehabilitation method recommended for a permanent solution is a complete or spot coating. Considering today’s metropolitans’ traffic and environmental conditions, it is an obligation to fix the sewer pipelines without excavations and trenchless sewer pipeline rehabilitation is gaining importance day by day. PVC Alloy is a term used to describe uniquely enhanced PVC material that has been specifically engineered for use in trenchless applications. Not only does the PVC Alloy have sufficient material stiffness to provide full, independent structural integrity, but it also has extremely high impact strength, enables high degree of dimensional stability. It can relieve high level of stress without structurally compromising the material. The PVC Alloy is an extremely resistant material. PVC Alloy material can be “thermoformed” at steam temperatures, enabling PVC Alloy Pipeliner to essentially “blow-mold” to the conformation of the host pipe. Upon “blow-molding,” PVC Alloy Pipeliner will conform almost exactly to the shape of an existing pipeline, including size transitions, tight bends, offset joints, and other irregularities. In addition to its strength, flexibility, ductility and tight fit, PVC Alloy Pipeliner is extremely resistant to chemicals and abrasion. In fact, years of laboratory tests and experience in actual installations indicate our product will not degrade in a typical sewer environment. At least 24 hours before starting the rehabilitation work, The people in the area who will be affected by the process must be informed. The construction of a temporary sewage bypass system by our company to direct the sewage elsewhere during rehabilitation process. The inspection of the pipeline which will be rehabilitated, with closed-circuit television (CCTV) systems. 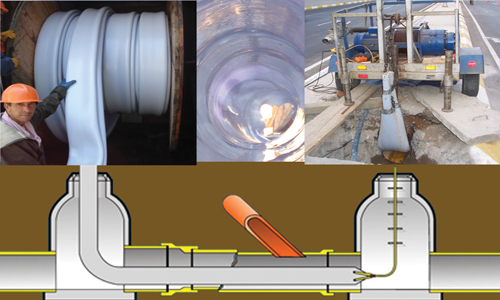 During this process we start preheating of the pipeline for PVC Alloy Pipeliner. PVC Alloy pipeliner wrapped on a wooden reel is heated in a closed trailer, injecting steam into the trailer. Heating the PVC Alloy Pipeliner takes between one to two and a half hours depending on the length will be inserted. The PVC Alloy Pipeliner is plugged at both ends to the steam processer and steam is pumped into the pipeliner. The PVC Alloy pipeliner is expanded with steam and fitted to the inside of the host pipe tightly. In normal conditions, this process takes a few hours. PVC Alloy Pipeliner’s tight fit against the irregular shape of the host pipe and thereby it reduces the risk of the leakage of groundwater between the host pipe and the pipeliner. After the PVC Alloy pipeliner has properly fitted, the ends are trimmed. Last stages, locating the lateral service lines and final video inspection of the complete pipeline inside the pipeliner with CCTV (closed circuit television). In the two-step lateral reopening process, first we use a robotic cutter to cut holes roughly for each service and then we use the milling robot to fully open the connection between the main pipeline and lateral service. It takes about 10 and 15 minutes for each lateral service. To control the quality, finally the images of the rehabilitated line are taken and recorded on a DVD. All images shot are delivered to the clients with a detailed report.